We're just days away from one of the most gut-wrenching mornings of the year. 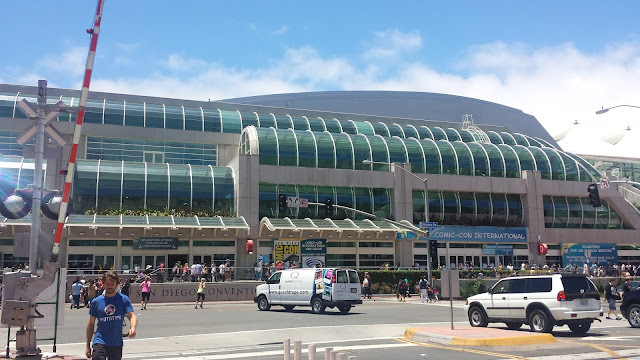 And while Returning Registration is only open to people who attended San Diego Comic-Con this past July, apparently some of you are still headed into your first badge sale. I guess that's not surprising, since many first-timers probably got their badges through a friend who handled the 2018 sale. Below are answers to the questions I've gotten about Returning Reg. You can only buy for people who attended 2018. If you were a first-timer this year, you might be eager to open the door to your friends who haven't gone yet - but that will have to wait for Open Registration. This Saturday, you're only allowed to buy for people who swiped their badges this past summer. They have to be official attendees, not press, pros or anything else. The various categories of SDCC citizens can involve a fair amount of crossover. People quit their blog/outlet job and lose their press credentials but want to keep going to the Con; or they decide to embrace the freedom of an attendee and leave vendor life behind. However, only people with a 2018 attendee badge can participate in Ret Reg. If you or your friends are transitioning from one category to another, you'll have to wait for Open Reg. You can't Paypal, Zelle, etc - this is credit card only. I know - some of you have dodgy credit or certain card limits or some other barrier to slapping 3 Preview Night badges on a Visa. The only answer here is to transfer funds to a debit card, make some arrangement with your bank for a temporary card or borrow someone's. Or find someone kind enough to cover you while you make installments. There's no payment plan. You need to pony up on the spot. I got an angry email this weekend from someone who informed me there was no way they could pay almost a thousand dollars this weekend. I don't make the prices. But they have a point everyone should consider - if you're working in a buying group and get picked while Preview Night badges are live, that's 3 badges at almost $300 a pop you'll need to pay for. Now imagine you're covering your own session and someone else's and they both get picked for Preview Night for 3 badges - that's $1800 you'll fork over. Ideally your comrades will pay you immediately but it's still something you're responsible for covering during the transaction. If someone buys you a badge, your waiting room session is still active - but you'll need to use other member IDs and names. Several people asked me this. Let's say a friend gets picked and buys your badge. You're taken care of - but you're still live in the waiting room. Should you drop out? Will your session be cancelled? No and no. Once you're picked, you can buy other people badges by inputting their last names and Member IDs. The system doesn't know or care that the person (you) who started that waiting room session already has a badge. And if you input someone's last name and Member ID who already has a badge - which can happen in the fast pace of a badge sale - the system will tell you that. Just move on to the next person who needs one. They don't release the exact percentage of badges sold, but it's a good amount. You're competing against a smaller number of people in this sale - so don't skip it. That said, if you don't do as well as you hope, you'll get a second chance in Open Registration. Let's say you only get Thursday and Sunday this weekend. In Open Reg, you can try again for Saturday, Friday and Preview Night. If this is your first badge sale, follow all of CCI's recommendations to test your system. Don't take a laissez-faire approach to this sale. Weird tech glitches and browser incompatibilities and other issues can crop up, so make sure you're in good shape ahead of time. If this is your first buying group, be respectful of other people's information and generosity. People will share quite a bit of personal information with their buying group - email addresses, last names, Paypal data, Facebook and Twitter info. Some people even swap credit card information. Be discreet. And don't be the person who "joins" multiple buying groups to better their chances. People will be able to tell that you're not actually participating and you'll just end up alienating potential friends and helpers. Yes, it's probably too late to join a buying group. But it doesn't hurt to ask. Just realize that most groups are formed by people who trust each other because they belong to the same forum or have interacted extensively online. If you're a complete stranger, people may not be ready to put their financial trust - or Comic-Con future - in your hands. It's not just a question of money and privacy, but also reliability. Can you be counted on to smoothly complete the sale? Will you try to sell your badge online six months from now, making CCI cancel all the badges in that transaction? People want to make sure nothing jeopardizes their SDCC badge, so expect some vetting. It's not personal. And one final tip - try to keep your calendar loose on Saturday. If you do fail to get a badge, you won't want to spend the afternoon or evening with people in a glum mood. But for now, think positive!